From the moment the first Pilgrims arrived on our shores, Americans have been asking, ‘what’s next? 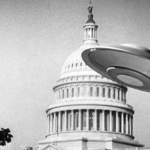 … In 1961, President Kennedy issued a challenge to America: to land a man on the moon and return him safely to Earth. 47 years ago on this very day, Neil Armstrong and Buzz Aldrin answered that call and walked on the moon … [I]n 2011, the space shuttle program ended. 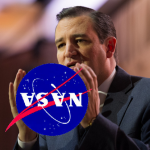 The last time the US launched our own astronauts from our own soil was over 5 years ago. We must do better than that! 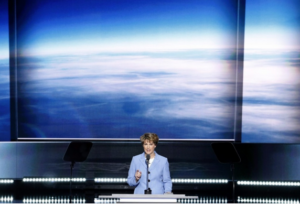 Significantly, in the end Collins snubbed Trump even though the speech’s official text called for her to say “We need leadership that will make America first again. 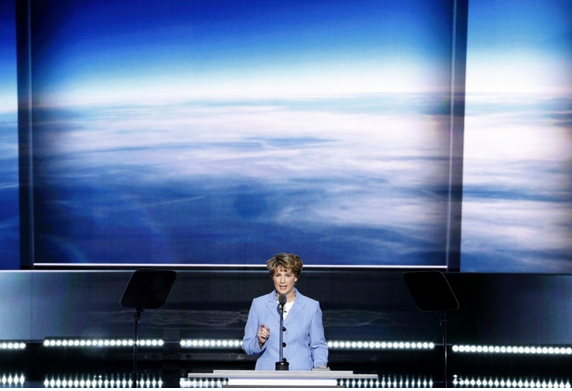 That leader is Donald Trump,” Perhaps as the teleprompter ominously rolled those words she realized the danger of hitching one’s wagon to a black hole. 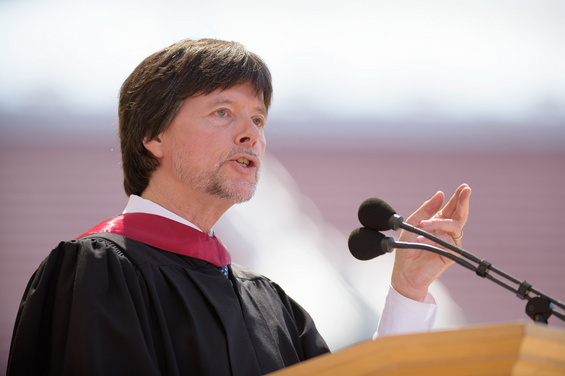 While the following comments by groundbreaking documentarian Ken Burns from his recent commencement address delivered at Stanford University may not at first seem to have direct relevance to this column, his status as an historian provides an eloquent argument to the threat of a Trump candidacy not only to the United States, but to the rest of the world and to the survival of the Earth. As a student of history, I recognize this type. He emerges everywhere and in all eras. 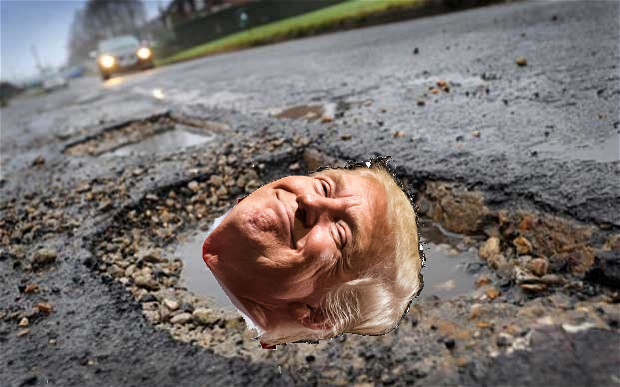 We see nurtured in his campaign an incipient proto-fascism, a nativist anti-immigrant Know Nothing-ism, a disrespect for the judiciary, the prospect of women losing authority over their own bodies, African Americans again asked to go to the back of the line, voter suppression gleefully promoted, jingoistic saber rattling, a total lack of historical awareness, a political paranoia that, predictably, points fingers, always making the other wrong. These are all virulent strains that have at times infected us in the past. 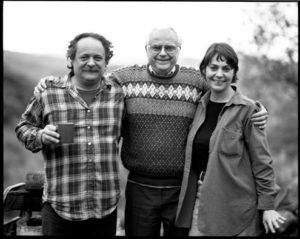 But they now loom in front of us again – all happening at once. We know from our history books that these are the diseases of ancient and now fallen empires. The sense of commonwealth, of shared sacrifice, of trust, so much a part of American life, is eroding fast, spurred along and amplified by an amoral Internet that permits a lie to circle the globe three times before the truth can get started. This is not a liberal or conservative issue, a red state, blue state divide. This is an American issue. 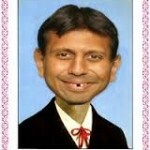 … I implore those “Vichy Republicans” who have endorsed him to please, please reconsider. We must remain committed to the kindness and community that are the hallmarks of civilization and reject the troubling, unfiltered Tourette’s of his tribalism. Juno’s first in-orbit portrait of Jupiter and three of its largest moons was taken days after the craft reached the Jovian system on July 4th. 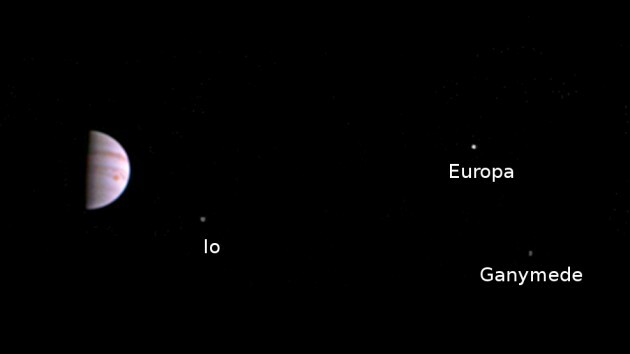 The orbiter’s “Juno-Cam” is expected to start taking high-resolution pix of the giant planet starting August 27th. China successfully blasts its new-generation Long March 7 rocket on June 25th. 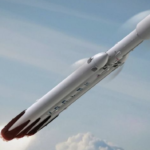 The retooled booster is expected to deliver and service China’s planned space station in the early 2020s. 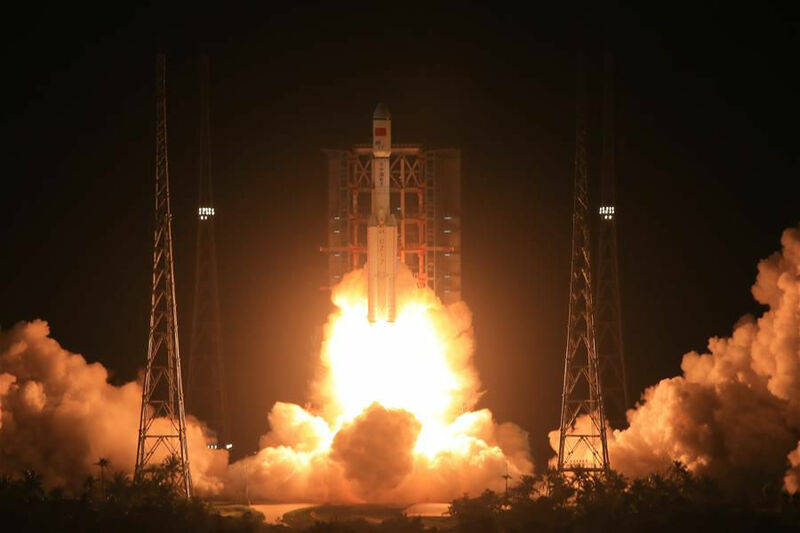 Chinese and Russian officials are discussing the possibility of combining their nations’ space exploration resources, with possible joint missions to the Moon and Mars, reports Forbes. “We’re developing an understanding for the rocket and space industry for possible interaction in such profound and technologically complex projects as the future exploration of the Moon, Mars and piloted cosmonautics,” Russian Deputy Prime Minister Dmitry Rogozin said in a statement last Wednesday. Rogozin’s comments come on the heels of Russian President Vladimir Putin’s visit to Beijing last month when the two nations set the legal framework on sensitive space technologies in cooperative launch vehicle and rocket engine programs. A picture of the recently-developed coronal hole on our Sun was taken by the Solar Dynamics Observatory that was launched in 2010. 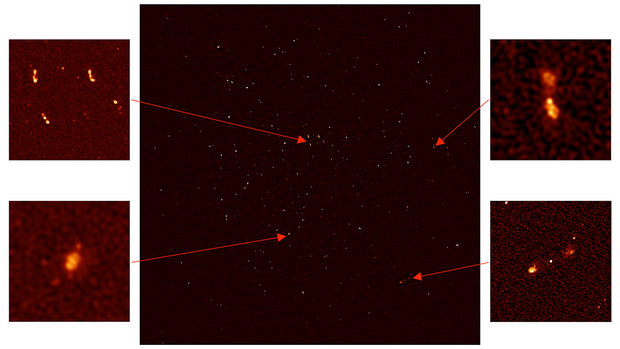 The black area represents energy emissions of ultraviolet and x-ray waves. 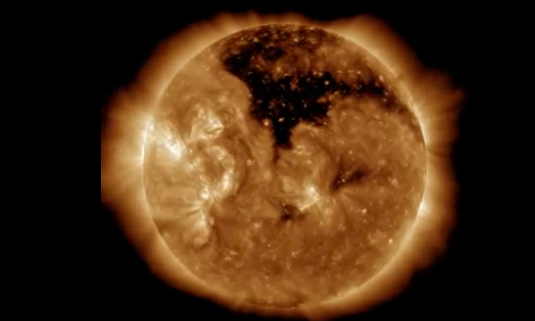 NASA scientists have observed an ominous coronal hole on the surface of the Sun that while being no big deal to the natural life cycle of our star, it could signal a raised threat of satellite communication disruption here on Earth. According to Universe Today, most solar black spots appear at the poles, but when they develop in the equatorial regions – as did the famous “Big Bird” hole in 2012 – they could run havoc on Earth-bound telecommunications and power grids. 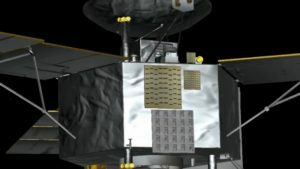 In fact, the Big Bird spot was a precursor to the most most powerful solar storm in 150 years, “If it had hit, we would still be picking up the pieces,” said Daniel Baker of the University of Colorado’s Laboratory of Atmospheric and space Physics. The pinpoints of light shown in the new 3-D scan of the known universe each represent a galaxy — approximately 1.2 million of them. 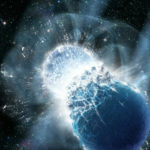 The newest 3-D marvel hasn’t been produced by some Hollywood dream factory, but by the inventive minds at the Baryon Oscillation Spectroscopic Survey (BOSS) who have fashioned a complex 3 dimensional map of our universe that covers 650 billion cubic light years of space and includes almost 1.2 million galaxies. According to GIzmodo, the astronomical scan provides one of the most precise measurements to date of the universe’s expansion, and upholds the leading theory that dark energy plays a major role in this augmentation. The SKA super telescope array will be capable of exploring deeper into space in unparallelled detail. 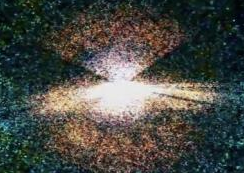 First light images taken by the MeerKat telescope reveal galaxies 200 million light years away. South African astronomers took its super-sized “MeerKat” radio telescope for a spin recently, and even at one quarter capacity, the powerful array spotted 1,300 new galaxies in a corner of the universe where only 70 were previously known. 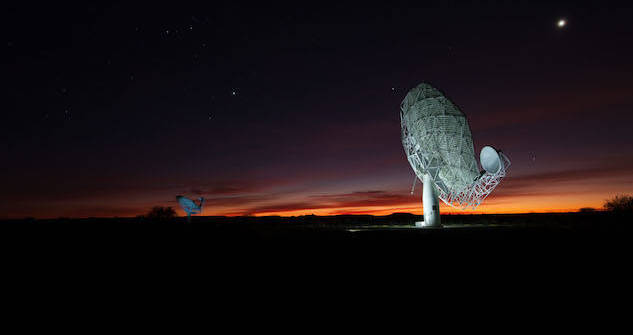 According to a chief scientist of the multi-nation square kilometre array (SKA), the first light images taken by MeerKat were “far better than we could have expected, … and is “already the best radio telescope in the southern hemisphere.” When fully online in the 2020s, the SKA will boast a army on 3,000 dishes across several countries, and will deliver observing power 10,000 times greater than most modern instruments, reports The Guardian. A gaggle of online news outlets have awkwardly earned the honorary “George W Bush We Don’t Have a Clue” award for their “Mission Accomplished” headlines following the successful arrival of NASA’s Juno spacecraft at Jupiter last week. 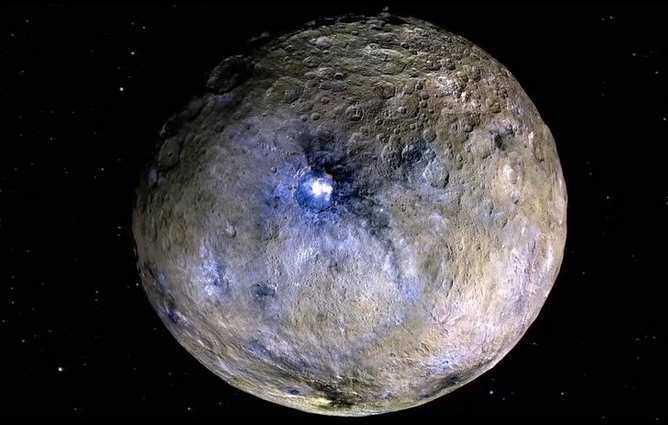 Of course we don’t have to set the record straight, since obviously the probe is in fact just starting its ground-breaking exploration of the solar system’s olympic-sized planet. After initial high-five celebrations on July 4 when Juno successfully entered Jupiter’s orbit, NASA engineers and scientists have been busy powering up the probe’s scientific instruments, as well as preparing for a trajectory correction this week to fine-tune the craft’s orbital path that will put it into a 14-day trajectory around the Jovian system. 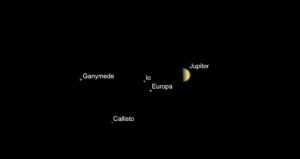 Currently, Juno is traveling in a 53.4-day orbital pattern where it will have its next closest approach to Jupiter on August 27 when NASA will be able to gather some preliminary data. 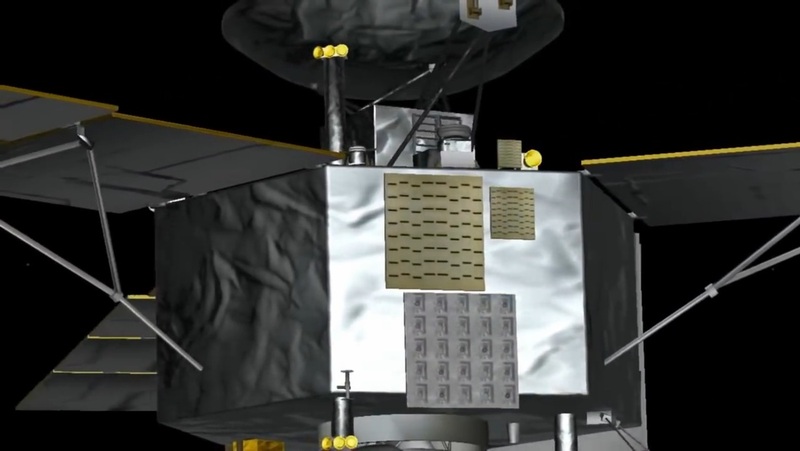 “You can expect us to release some information about our [initial] findings around September 1,” said mission project manager Rick Nybakken. 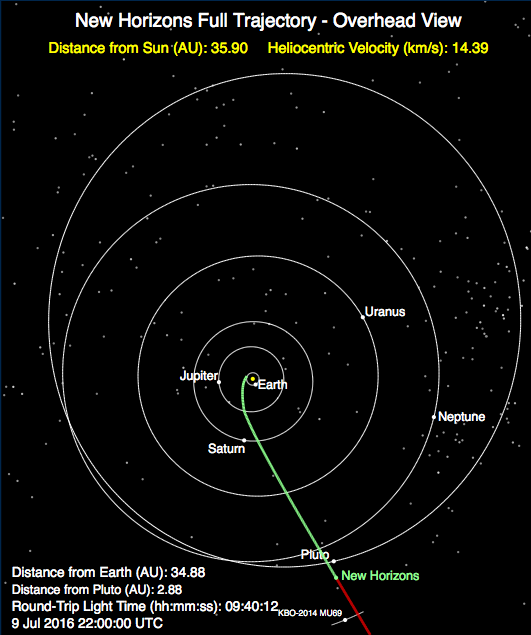 New Horizon’s craft current trajectory towards 2014 MU69. Just prior to Juno’s much-ballyhooed arrival at Jupiter, NASA announced late last month that it will extend the lives of nine other older robotic spacecraft that have continued to operate beyond their expiration dates. 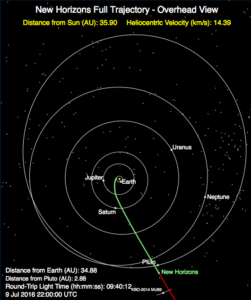 The most significant of these green-lit missions involves the space agency sending its New Horizons craft deeper into the Kuiper Belt where it will rendezvous with an ancient planetoid known as 2014 MU69 on New Year’s Day 2019. According to Universe Today, the close encounter with 2014 MU69 will be the most distant up-close view of a celestial object in human history. In other mission-extension news of note, after a mini-mutiny by a handful of researchers who campaigned to ship the Dawn spacecraft from Ceres to Adeona (another asteroid belt object), NASA decided to keep the probe parked where it is, explaining that, “The long-term monitoring of Ceres, particularly as it gets closer to perihelion … has the potential to provide more significant science discoveries than a flyby of Adeona,” NASA also reasoned that he funding required for a multi-year mission to Adeona would be difficult considering the space agency’s constrained budget. 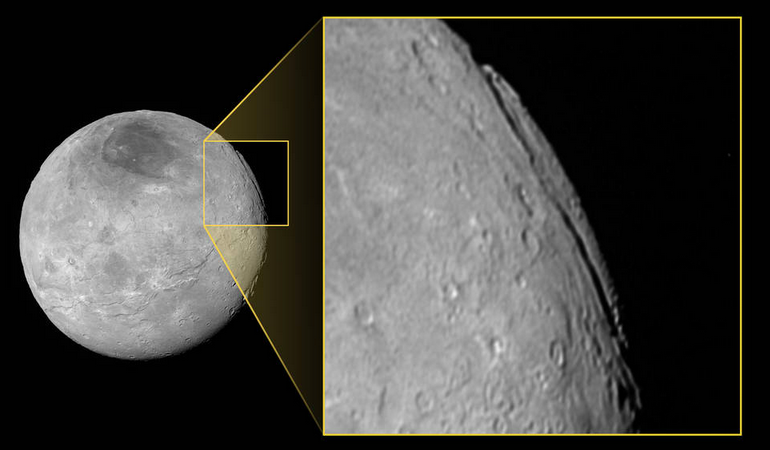 NASA recently released a photo of a “super grand canyon” on Pluto’s largest Moon, Charon that potentially is longer and deeper than any in our local star system. The photo above, taken a year ago on July 14, 2015, provides a side view of the informally-named Argo Chasma canyon that measures approximately 430 miles long and 5.5 miles deep (compared with Arizona’s Grand Canyon, which is 280 miles long and a little over a mile deep). The space agency notes that there are areas of Argo Chasma where the shear cliffs rival Verona Rupes on Uranus’ moon Miranda (which are at least 3 miles high) for the title of tallest known cliff face in the solar system. 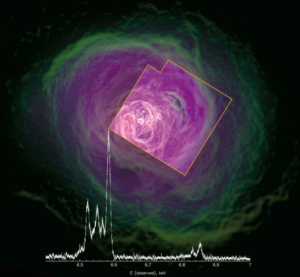 Japan’s lost Hitomi satellite took X-ray data of a galaxy cluster 240 million light years away before going silent earlier this year. Japan’s doomed Hitomi satellite, which managed to remain in orbit for only a month earlier this year before it mysteriously spun out of control, apparently was able to conduct some black hole-hunting before it blacked out and merged with the infinite. In a new paper published in Nature, researchers have disclosed some findings based on last-minute data collected by the craft that could offer significant clues to the role of black holes in galaxy formation. 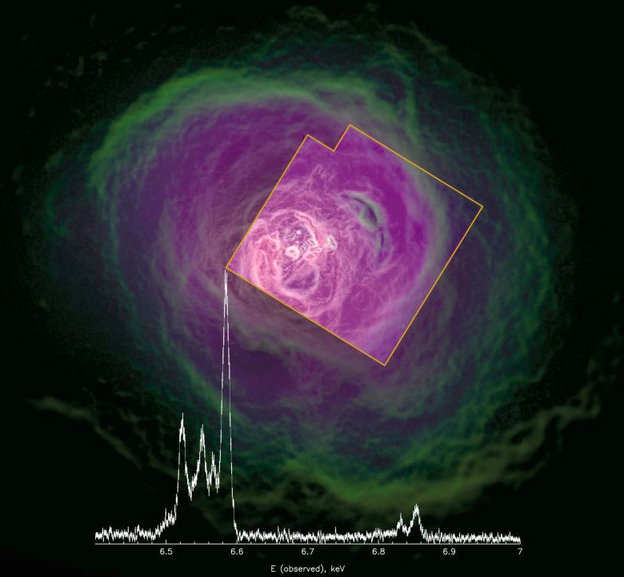 According to Hitomi’s last-minute X-ray observations of the Perseus galaxy cluster located 240 million light years away, there appears to be less-than-expected radiation activity generated from the cluster’s supermassive black hole.“The surprise is that it turns out that the energy being pumped out of the black hole is being very efficiently absorbed,” co-author Brian McNamara of the University of Waterloo told Gizmodo. “What it shows is that black holes very effectively control the growth rate of galaxies,” said McNamara, adding that these exotic super gravity wells play a big role in the eventual size of a galaxy. 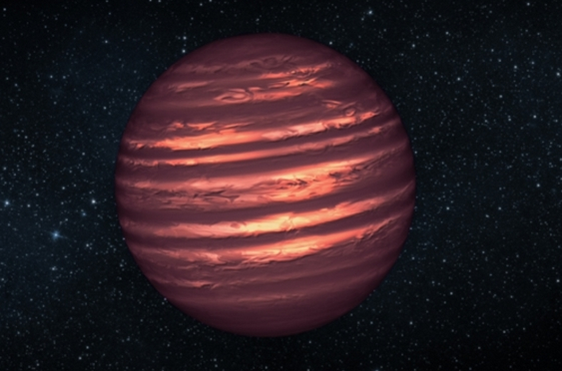 Artist rendition of a brown dwarf star. Astronomers are on cloud nine following the announcement that researchers have found the first strong evidence of water vapor on a celestial body outside our solar system. 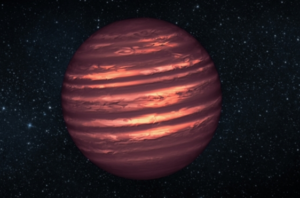 According to Scientific American, University of California, Santa Cruz scientists, have released their findings on recent observations of the “failed star” WISE 0855, which lives 7.2 light-years from Earth, and most likely has water clouds or water ice in its atmosphere. 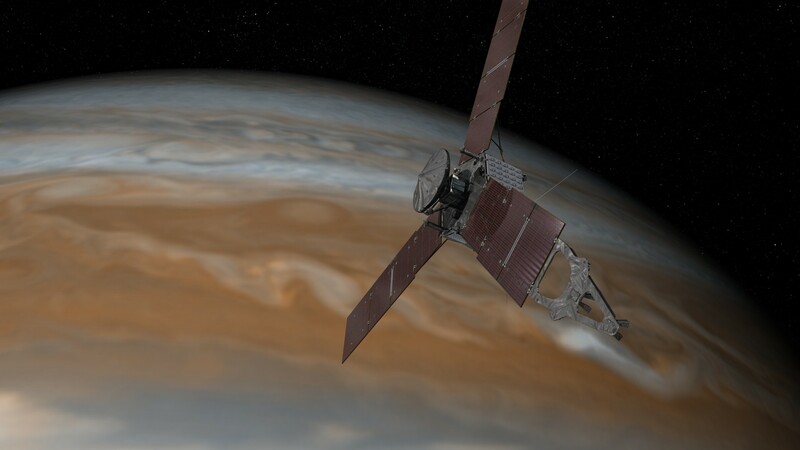 NASA’s Juno orbiter will reach Jupiter today, sliding into a polar orbit as it gets poised to collect data on the “gas giant’s” atmosphere, composition, layering, and much more. The craft is expected to provide insights into the top 400 miles of the giant planet’s upper-most “cloud” band, including the nature and localities of Jovian water. These surveys and their results should be quite exciting. NASA’s Juno craft will use a microwave sensor to detect the presence of water as it orbits 2,600 miles above Jupiter. Photo of Jupiter and its four biggest moons taken by the Juno spacecraft on June 21st at a distance of 6.8 million miles from the Jovian system. #1: If any planet pulls in water Jupiter must be drenched with it. The comets, asteroids, and moonlets that have been sucked into the massive planet over billions of years would supply plenty. #2: Jupiter’s lightning storms are monumental and make Earth’s storms appear puny. Water, in copious amounts, accounts for this. #3: The Shoemaker-Levy comet, which split into dozens of impacting pieces, dredged up huge plumes of water. #4: With all this water that has been trapped below the visible surface, you might wonder where it lies within Jupiter’s cross-section. For over forty years I’ve seen in the scientific literature findings of liquid hydrogen and helium layers, electric hydrogen and helium, a core, but no vast oceans of water. So where does the water go? Turn into steam? I think not. And what about the oxygen in water? Oh yeah, no mention of that either!!! Juno’s Microwave Radiometer instrument will study the structure, movement, and chemical composition of Jupiter’s cloud cover to a depth of about 550 km, and will help determine the abundance of water and ammonia in the Jovian atmosphere. #5: Jupiter’s great bands–these indicate a world-wide ocean having floating masses, such as ice, pumice, etc. #6: Pressure/ Temperature graphs cannot show the state’s(gas, liquid, solid, plasma) of the complex chemicals found here. 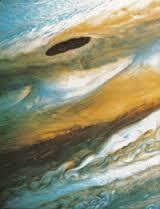 #1: Since Jupiter is the largest planet, it’s hard to imagine it not having life of at least microbial size. (I dare say macrobial life.) While scientists often go on about life to be found in the acidic, cooler, parts of Venus’ atmosphere–Jovian lifeforms are a better bet. 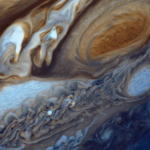 #2: The colors and complex interactions of Jovian clouds surely look like the forces of life at work. #3: Jupiter’s immense radiation belts would secure a safe environment for life. #4: Jupiter is a heat emitter–there’s bound to be a wide zone for life to thrive. #5: Life is found abounding on Earth, even in extreme environments. 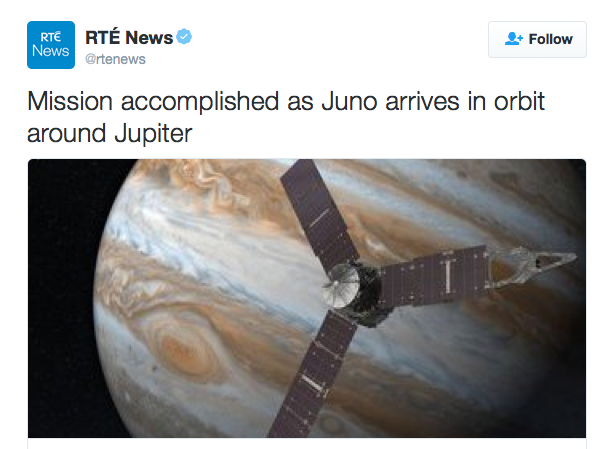 Ok. I’ve said enough for now–Juno will be relaying it’s results for many months to come. We watch for now. Kemp Woods (far left), standing along side SETI founder Frank Drake and Galactic Sandbox’s own Kate Woods. CA. 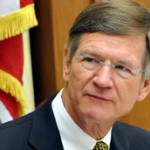 He has been arduously studying the cosmos and exobiology for the past 45 years. 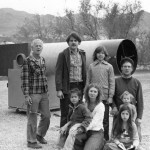 During this time, Woods has studied radio waves alongside the famous, SETI founder Frank Drake, and has made many stellar and planetary observations with his 17 inch Dobsonian telescope.